How to draw arcs linking two points in TikZ? I am a beginner in LaTeX, tentatively using it for industrial documents. I am having difficulties with drawing arcs in TikZ. In the MWE, I am trying a routine that would draw a series of coding mechanical keys, in order to clarify the coding pattern. 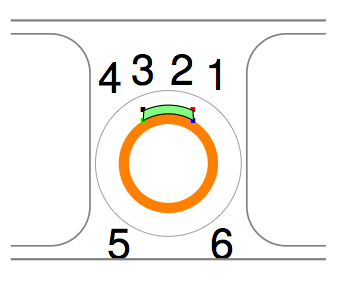 (It is based on protrusions that should be aligned with some of the numbers shown) Each key is a hollow cylinder, outer dia \DiaExt, section shown in orange, and there is one or several protrusions, width \KeyWidth, placed at different angles on the outer envelope. (only one is shown tentatively in the MWE by showing the 4 envelope points). Their location is now calculated in the code.The points black and green should be connected by a vertical segment, the points red and blue also. The lower points green and blue are to be connected by an arc diameter \DiaExt. In fact in the final picture, all the points are to be connected and the inner area filled in orange, to make a continuum with the orange area. How to draw the path between the points black, red, blue green automatically, in such a way that several other keys could be made on the same principle. I have found a way to adjust the size of the engraved numbers to match the reel parts, but not in a way that adjusts if the scale of the picture is modified. Is there a way to make the size of the numbers following the scale of the main picture? How to use variables in draw?